From the Alzheimer's Drug Discovery Foundation, New York, NY. Geroscience is a multidisciplinary field that examines the relationship between biological aging and age-related diseases.3 The trans-NIH Geroscience Interest Group Summit discussed 7 processes that contribute to biological aging: macromolecular damage, epigenetic changes, inflammation, adaptation to stress, and impairments in proteostasis, stem cell regeneration, and metabolism.1 Intriguingly, these 7 processes are highly intertwined with one another. Thus, targeting the common biological processes of aging may be an effective approach to developing therapies to prevent or delay age-related diseases. The leading risk factor for sporadic Alzheimer disease (AD) is also aging. Processes that are altered with aging that have been implicated in AD include inflammation, impaired autophagy, mitochondrial dysfunction, vascular problems, epigenetic changes, and synaptic loss (figure). An increased incorporation of extensive knowledge regarding biological gerontology into research on AD would likely increase our productivity in developing new drugs for AD. 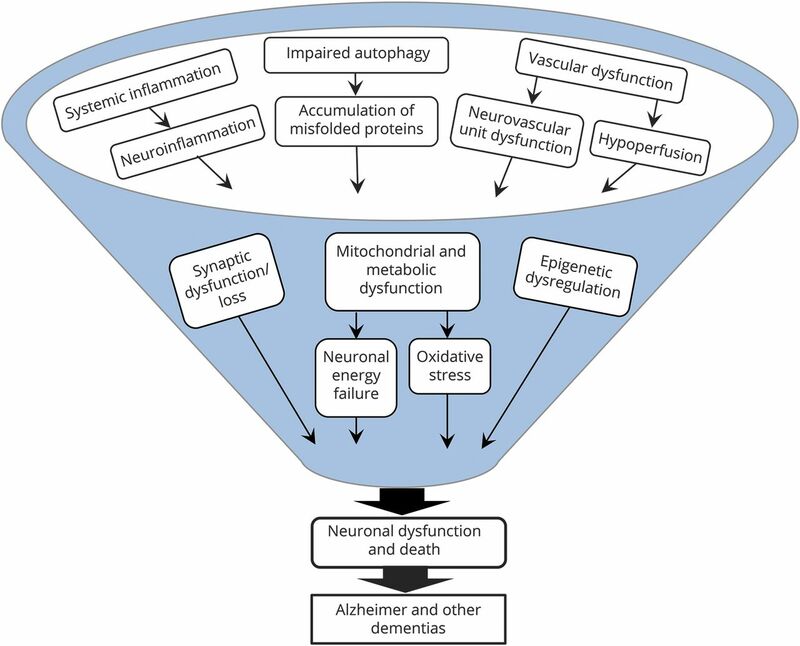 Processes that are altered with aging that precede neurodegeneration include inflammation, impaired autophagy, vascular dysfunction, synaptic loss, mitochondrial and metabolic dysfunctions, and epigenetic changes. These processes provide numerous novel targets for new drug development for AD. Pathologic hallmarks of AD include senile plaques comprising β-amyloid (Aβ) proteins along with many other misfolded proteins and neurofibrillary tangles formed by hyperphosphorylated tau protein aggregates. The accumulation of plaques and tangles occurs over many decades, in association with aging. While Aβ can be detected in early adulthood even in cognitively healthy people, elevated amyloidosis begins in the 6th decade of life and increases linearly into old age.4 Medial temporal tauopathy also begins in middle age and overt cognitive impairment coincides with increased neurofibrillary tangle burden.5 Clearly, pathologic and clinical findings indicate that sporadic AD and related dementias are age-related diseases. Because the mechanisms underlying AD and related dementias are complex and multifactorial, greater exploration of targets beyond these 2 pathologic markers is warranted. Senescent cells are thought to fuel aging and age-related pathologies as they release proinflammatory cytokines, chemokines, and tissue-damaging proteases and can negatively affect the surrounding tissue microenvironment.18 Senolytic drugs are drawing attention as they selectively induce apoptosis of these senescent cells. While senolytic drugs appear to provide beneficial effects in rodent models of aging, they may also be associated with slowed wound healing.19 Further work is needed to establish a causal link between senescent cell accumulation and AD before these drugs can be translated into the clinic. In addition, drugs targeting specific phenotypes of myeloid cells or select elements of the complement pathway are in preclinical and clinical development.20,21 It is critical that these agents inhibit the detrimental aspects of inflammation while preserving the defense mechanisms against pathogens and tissue damage and allowing for continued phagocytosis by microglia. The free radical theory of aging, the idea that free radicals produced in the course of cellular metabolism contribute to aging and degenerative diseases, was first introduced in 1956 by Harman.27 Indeed, mitochondrial dysfunction and oxidative stress increase with aging and are tightly linked to neurodegeneration. High metabolic demands along with low levels of antioxidative defense mechanisms make the brain especially vulnerable to oxidative damage.28 Aging and AD are associated with inefficient mitochondria and an imbalance between pro-oxidants and antioxidants, which in turn, induce oxidative damage to DNA, proteins, and lipids in the brain. To date, antioxidant agents have not been successful in treating AD,29 partly due to their low bioavailability and poor blood–brain barrier penetration. They may also block oxidative signaling that is necessary for normal cellular functioning. There are 14 interventions targeting mitochondrial or metabolic dysfunctions that are currently in clinical trials for AD (table 2).6 Many of these are repurposed drugs and 7 are antidiabetics. Type 2 diabetes mellitus is a significant risk factor for AD and both diseases share pathologies including insulin resistance and oxidative stress.30 Thus, insulin, its derivatives, and drugs designed to improve insulin sensitivity such as liraglutide and exenatide are currently being tested for AD (table 2). Agents that specifically target mitochondria to decrease mitochondria-derived reactive oxygen species may also hold promise for preventing neuronal dysfunction and death. For example, CP2 is a cell-permeable tricyclic pyrone that crosses the blood–brain barrier and accumulates in neuronal mitochondria.31 It mildly inhibits the mitochondrial complex I, producing a mito-hormetic effect, augmenting respiratory capacity and reducing proton leak in wild-type mice. CP2 also prevents cognitive impairment in mouse models of AD (APP, PS1, and APP/PS1) while reducing amyloid plaques and phosphorylated tau. SS-31 is another example of a compound with mitochondria-specific actions. It is a small peptide that binds to cardiolipin, a lipid exclusively expressed on the inner mitochondrial membrane that plays a structural role in organizing the components of the electron transport chain into supercomplexes for more efficient oxidative phosphorylation.32,33 SS-31 also inhibits the opening of the mitochondrial permeability transition pore that forms under mitochondrial stress, which can lead to mitochondrial swelling and apoptosis.34 Preclinical studies have shown that SS-31 prevents anesthesia-induced cognitive impairment and promotes mitochondrial and synaptic health in models of AD.34,35 SS-31 (elamipretide) is currently being tested in clinical trials for rare disease indications, including mitochondrial myopathy, Barth syndrome, Leber hereditary optic neuropathy, and Huntington disease (stealthbt.com/clinical). A repurposing opportunity for SS-31 exists for AD. While managing vascular risk factors such as hypertension, dyslipidemia, and diabetes is likely to improve long-term brain health and lower dementia risk, additional efforts to target specific vascular pathobiologies are needed. For example, upon blood–brain barrier disruption or vascular breakdown, fibrinogen leaks into the CNS, resulting in formation of clots comprising insoluble fibrin and inflammation.39 Extravascular fibrin(ogen) then interacts with microglia via the integrin receptor CD11b/CD18, which induces secretion of cytokines and chemokines and stimulates recruitment of peripheral monocytes and macrophages.40 While fibrinogen is undetectable in the healthy brain, it is present in the brains of patients with AD as well as in older people without AD pathology.41,42 Aβ also interacts with fibrinogen and coagulation factor XII, which can further increase clotting, fibrin deposition, and proinflammatory molecules.43 Therefore, a higher plasma level of fibrinogen is associated with an increased risk for AD and vascular dementia.44 Thrombin, an enzyme in blood plasma that causes blood clotting by converting fibrinogen to fibrin, is also elevated in the brains of patients with AD, and produces proinflammatory effects on endothelial cells, microglia, and astrocytes.45 Targeting the coagulation system may reduce fibrin formation, neuroinflammation, and neurodegeneration; however, it is important to specifically target the pathogenic properties of coagulation proteins without affecting the beneficial processes of blood clotting. Aging is also accompanied by important epigenetic changes including histone modifications, DNA methylation, and microRNA expression, resulting in alterations in gene expression and genome architecture.46 As epigenetic mechanisms are critical for normal brain function, including learning and memory processes, epigenetic dysregulations may contribute to the onset of cognitive dysfunction and AD.47 Because age- and disease-related epigenetic disturbances are potentially reversible, they have drawn attention as attractive targets for pharmacologic interventions particularly in cancer therapies, but they are also gaining traction in neurodegenerative diseases. There are a few epigenetic drugs currently being tested in clinical trials for AD. Vorinostat, a pan-histone deacetylase (HDAC) inhibitor approved for the treatment of cutaneous T-cell lymphoma, is currently in phase I trial in patients with AD.48 ORY-2001 is a selective dual LSD1-MAO-B inhibitor that has shown marked cognitive improvement in transgenic AD models, and phase I results showed safety, tolerability, and brain penetrance.49 LSD1 is an epigenetic modulator that regulates histone methylation. The major advantage of epigenetic drugs is that they can regulate expression of multiple genes critical for neuronal functions. However, studies are required to confirm that these drugs aimed to counter neurodegeneration in the brain do not also increase gene expression associated with harm, such as tumorigenesis. Preclinical efforts addressing these safety issues are also underway, including selective inhibitors of HDAC2 that show functional efficacy and reduced side effects in animal models (rodintherapeutics.com/our-approach/#literature). Normal age-related cognitive decline is not accompanied by the extensive neuronal loss seen in AD and other dementias; however, it is associated with dysfunctions and loss of cortical synapses.50 These synaptic alterations occur in the same circuits that degenerate in AD. Based on a postmortem study, synapse loss is observed in a large proportion of people with mild cognitive impairment and appears to be an early event in the disease process that precedes neuronal loss in AD.51 Because age-related synaptic alterations may render neurons more vulnerable to degeneration, maintaining synaptic health in the face of aging may be an important strategy for preventing neurodegeneration. As discussed above, multiple processes go awry with aging, many of which negatively affect neuronal and cognitive health and ultimately contribute to the onset and progression of AD. Therefore, a combination of drugs to address these systems may be necessary to effectively treat it. There are currently 11 combination therapy clinical trials (table 5), of which 5 are testing an add-on therapy to an already approved AD drug (e.g., donepezil), and several others are using multiple drugs to target Aβ.6 In 2018, a phase 2 clinical trial to test AMX0035, a combination of sodium phenylbutyrate and tauroursodeoxycholic acid (TUDCA), is expected to begin. Sodium phenylbutyrate is an FDA-approved therapy for urea cycle disorders and it is a Class I and II HDAC inhibitor. Preclinical studies have shown that it also acts as a chemical chaperone and ameliorates ER stress, prevents neuronal loss, increases clearance of intraneuronal Aβ, and restores cognitive functions in AD mouse models.53,–,55 TUDCA is a bile acid that supports mitochondrial energetics by reducing mitochondrial permeability and increasing apoptotic thresholds of cells.56 Studies in an AD mouse model (APP/PS1) have shown that TUDCA decreases Aβ deposits, reduces glial activation, and restores cognitive functions.57,58 Together, the 2 drugs are designed to restore epigenetic changes, reduce cellular stress, and protect against neurodegeneration, mitochondrial dysfunction, and neuroinflammation. Combination trials present some challenges as each drug needs to be tested for safety, and multiple biomarkers are often required to ensure target engagement and to monitor disease progression and response to treatment. Some evidence of efficacy should be demonstrated for each drug, though benefits of each may be incremental. Combination therapies that target multiple age-related dysfunctions with synergistic activities are especially promising for treating AD. More such combination studies are needed. Biological aging is the leading risk factor for the major debilitating chronic diseases of old age that cause morbidity and mortality, including AD and other dementias. Drugs that treat fundamental biological mechanisms of aging have been proposed to be useful for most prevalent chronic diseases of aging.18 In fact, many repurposed drugs are used to treat other age-related diseases. Despite over 75 years of accumulated research on biological aging,59 the current drug development pipeline is dominated by therapeutics targeting Aβ and tau, and there has been proportionately less translation of biological gerontology into our efforts to develop drugs for AD. Nevertheless, aging biology provides numerous novel targets for new drug development for AD (figure). Because of the multifaceted nature of biological aging, it is unlikely that drugs addressing a single target will be very successful in effectively treating AD. Nevertheless, single drug clinical trials may be needed to demonstrate incremental benefits, even if modest, before combination trials can be pursued. As interventions that target one aberrant system tend to also attenuate others, ultimately, combination therapies that target multiple age-related dysfunctions may produce synergistic activities. Combination therapies are already the standard of care for other diseases of aging, including heart disease, cancers, and hypertension, and will likely be necessary in treating AD and other dementias. And because the same biological aging mechanisms underpin the common diseases of aging, repurposing drugs already on the market is a rational strategy for testing new therapies for AD and related dementias, including the sporadic forms of frontotemporal dementia and vascular dementia. Novel therapeutics for new and relevant targets will clearly also be needed. In addition to combination therapies, addressing the multifaceted nature of the relationship between biological aging and AD with drugs possessing pleiotropic effects (simultaneously producing more than one effect) will be advantageous. In clinical areas such as oncology, psychiatry, and cardiovascular medicine, many effective drugs act on multiple targets while single-targeted approaches seldom progress to the final stages of clinical trials.60 For example, statins are widely used to lower cholesterol levels in patients with dyslipidemia, but statins also have pleiotropic effects that are independent of their effects on cholesterol, including improved endothelial function, inhibition of vascular inflammation, stabilization of atherosclerotic plaques, and immunomodulation.60 To effectively treat AD, pleiotropic drugs may need to hit the right nodes of relevant biological networks affected by aging such that they positively influence those networks and interconnected pathways. Finally, a parsimonious approach to drug discovery and development with regard to translating knowledge from biological aging to AD is needed. For example, due to the plethora of misfolded proteins that accumulate with aging in the brain, biologics that attempt to address a single misfolded protein may be far less efficacious than drugs that enhance autophagy and clearance of all misfolded proteins. Similarly, age-related inflammation, vascular disease, epigenetic dysregulation, mitochondrial/metabolic dysfunction, and synaptic failure may be upstream causes of neuronal dysfunction and death leading to the classic pathologic hallmarks that have been historically among the first drug targets in AD. A better understanding and translation of the systemic, cellular, and molecular processes of biological aging that precede and increase vulnerability to AD will help identify new strategies and therapeutic targets for drug discovery and development. This work was supported by a donation to the Alzheimer's Drug Discovery Foundation by an anonymous foundation. Alzheimer's Drug Discovery Foundation has funded or cofunded several projects to develop or clinically test the following drugs that are discussed in the article: nilotinib, CP2, GC021109, LM11A-31, and ORY-2001. Go to Neurology.org/N for full disclosures. Funding information and disclosures deemed relevant by the authors, if any, are provided at the end of the article. The Article Processing Charge was funded by a donation to the Alzheimer's Drug Discovery Foundation by an anonymous foundation. The Article Processing Charge was funded by a generous donation to the Alzheimer's Drug Discovery Foundation by an anonymous foundation.
. Geroscience: linking aging to chronic disease. Cell 2014;159:709–713.
. Biological implications of the Weibull and Gompertz models of aging. J Gerontol A Biol Sci Med Sci 2002;57:B69–B76.
. A long tradition in advancing aging biology and translational gerontology. J Gerontol A Biol Sci Med Sci 2018;73:271–272.
. Increased florbetapir binding in the temporal neocortex from age 20 to 60 years. Neurology 2017;89:2438–2446.
. Tau-targeting therapies for Alzheimer disease. Nat Rev Neurol 2018;14:399–415. Alzheimer's Drug Discovery Foundation 2017. Closing in on a Cure: 2017 Alzheimer's Clinical Trials Report. Available at: alzdiscovery.org/research-and-grants/clinical-trials-report/closing-in-on-a-cure-2017. Accessed July 26, 2018.
. Drug discovery effectiveness from the standpoint of therapeutic mechanisms and indications. Nat Rev Drug Discov 2018;17:19–33.
. Chronic inflammation (inflammaging) and its potential contribution to age-associated diseases. J Gerontol A Biol Sci Med Sci 2014;69(suppl 1):S4–S9.
. Systemic inflammation as a predictor of brain aging: contributions of physical activity, metabolic risk, and genetic risk. Neuroimage 2018;172:118–129.
. Elevated markers of inflammation are associated with longitudinal changes in brain function in older adults. J Gerontol A Biol Sci Med Sci 2018;73:770–778.
. Brain morphology links systemic inflammation to cognitive function in midlife adults. Brain Behav Immun 2015;48:195–204.
. Neuroinflammation in Alzheimer's disease. Lancet Neurol 2015;14:388–405. Study evaluating safety, tolerability, and PK of multiple ascending doses of GC021109 in subjects with mild to moderate Alzheimer's disease. 2015. Available at: clinicaltrials.gov/ct2/show/study/NCT02386306. Accessed July 26, 2018. GC 021109. Alzforum. Available at: alzforum.org/therapeutics/gc-021109. Accessed July 26, 2018.
. Drivers of age-related inflammation and strategies for healthspan extension. Immunol Rev 2015;265:63–74.
. Resolution of inflammation: a new therapeutic frontier. Nat Rev Drug Discov 2016;15:551–567.
. The resolution code of acute inflammation: novel pro-resolving lipid mediators in resolution. Semin Immunol 2015;27:200–215.
. The clinical potential of senolytic drugs. J Am Geriatr Soc 2017;65:2297–2301.
. Cellular senescence in brain aging and neurodegenerative diseases: evidence and perspectives. J Clin Invest 2018;128:1208–1216.
. Central nervous system myeloid cells as drug targets: current status and translational challenges. Nat Rev Drug Discov 2016;15:110–124.
. Therapeutic targeting of complement to modify disease course and improve outcomes in neurological conditions. Semin Immunol 2016;28:292–308.
. Autophagy and aging. Cell 2011;146:682–695.
. Varied effects of age-related neuropathologies on the trajectory of late life cognitive decline. Brain 2017;140:804–812.
. Impact of nilotinib on safety, biomarkers and clinical outcomes in mild to moderate Alzheimer's disease (AD). 2016. Available at: clinicaltrials.gov/ct2/show/NCT02947893. Accessed July 26, 2018.
. Nilotinib-induced autophagic changes increase endogenous parkin level and ubiquitination, leading to amyloid clearance. J Mol Med 2014;92:373–386.
. Promoting autophagic clearance: viable therapeutic targets in Alzheimer's disease. Neurotherapeutics 2015;12:94–108.
. Antioxidative defense mechanisms in the aging brain. Arch Biol Sci 2014;66:245–252.
. Antioxidants for Alzheimer disease: a randomized clinical trial with cerebrospinal fluid biomarker measures. Arch Neurol 2012;69:836–841.
. Insulin as a bridge between type 2 diabetes and Alzheimer disease: how anti-diabetics could be a solution for dementia. Front Endocrinol 2014;5:110.
. Modulation of mitochondrial complex I activity averts cognitive decline in multiple animal models of familial Alzheimer's Disease. EBioMedicine 2015;2:294–305.
. The mitochondrial-targeted compound SS-31 re-energizes ischemic mitochondria by interacting with cardiolipin. J Am Soc Nephrol 2013;24:1250–1261.
. First-in-class cardiolipin-protective compound as a therapeutic agent to restore mitochondrial bioenergetics. Br J Pharmacol 2014;171:2029–2050.
. BDNF pathway is involved in the protective effects of SS-31 on isoflurane-induced cognitive deficits in aging mice. Behav Brain Res 2016;305:115–121.
. Mitochondria-targeted antioxidant SS31 prevents amyloid beta-induced mitochondrial abnormalities and synaptic degeneration in Alzheimer's disease. Pharmaceuticals 2012;5:1103–1119.
. Vascular contributions to cognitive impairment and dementia: a statement for healthcare professionals from the American Heart Association/American Stroke Association. Stroke 2011;42:2672–2713.
. Contribution of cerebrovascular disease in autopsy confirmed neurodegenerative disease cases in the National Alzheimer's Coordinating Centre. Brain 2013;136:2697–2706.
. The pathobiology of vascular dementia. Neuron 2013;80:844–866.
. Breaking boundaries-coagulation and fibrinolysis at the neurovascular interface. Front Cell Neurosci 2015;9:354.
. Blood coagulation protein fibrinogen promotes autoimmunity and demyelination via chemokine release and antigen presentation. Nat Commun 2015;6:8164.
. A leaky blood-brain barrier, fibrinogen infiltration and microglial reactivity in inflamed Alzheimer's disease brain. J Cell Mol Med 2009;13:2911–2925.
. Alterations in the blood brain barrier in ageing cerebral cortex in relationship to Alzheimer-type pathology: a study in the MRC-CFAS population neuropathology cohort. Neurosci Lett 2011;505:25–30.
. Interactions of beta-amyloid peptide with fibrinogen and coagulation factor XII may contribute to Alzheimer's disease. Curr Opin Hematol 2017;24:427–431.
. Fibrinogen is associated with an increased risk of Alzheimer disease and vascular dementia. Stroke 2005;36:2637–2641.
. Targeting thrombin: an inflammatory neurotoxin in Alzheimer's disease. J Alzheimers Dis 2014;42(suppl 4):S537–S544.
. Epigenetics of aging and aging-related disease. J Gerontol A Biol Sci Med Sci 2014;69(suppl 1):S17–S20.
. Epigenetic mechanisms during ageing and neurogenesis as novel therapeutic avenues in human brain disorders. Clin Epigenetics 2017;9:67.
. Clinical trial to determine tolerable doses of vorinostat in patients with mild Alzheimer disease (VostatAD01). 2017. clinicaltrials.gov/ct2/show/NCT03056495. Accessed July 26, 2018.
. First-in-human phase I results show safety, tolerability and brain penetrance of ORY-2001, an epigenetic drug targeting LSD1 and MAO-B. Alzheimers Dement 2017;13:P1573–P1574.
. The ageing cortical synapse: hallmarks and implications for cognitive decline. Nat Rev Neurosci 2012;13:240–250.
. Hippocampal synaptic loss in early Alzheimer's disease and mild cognitive impairment. Neurobiol Aging 2006;27:1372–1384.
. A small molecule p75NTR ligand, LM11A-31, reverses cholinergic neurite dystrophy in Alzheimer's disease mouse models with mid- to late-stage disease progression. PLoS One 2014;9:e102136.
. Phenylbutyrate is a multifaceted drug that exerts neuroprotective effects and reverses the Alzheimer s disease-like phenotype of a commonly used mouse model. Curr Pharm Des 2013;19:5076–5084.
. Long-term phenylbutyrate administration prevents memory deficits in Tg2576 mice by decreasing Abeta. Front Biosci 2011;3:1375–1384.
. Phenylbutyrate rescues dendritic spine loss associated with memory deficits in a mouse model of Alzheimer disease. Hippocampus 2012;22:1040–1050.
. Amyloid beta-peptide disrupts mitochondrial membrane lipid and protein structure: protective role of tauroursodeoxycholate. Biochem Biophys Res Commun 2001;281:468–474.
. Amyloid-beta pathology is attenuated by tauroursodeoxycholic acid treatment in APP/PS1 mice after disease onset. Neurobiol Aging 2015;36:228–240.
. TUDCA, a bile acid, attenuates amyloid precursor protein processing and amyloid-beta deposition in APP/PS1 mice. Mol Neurobiol 2012;45:440–454.
. Gerontology. J Gerontol 1946;1:1–12.
. Technological advances and proteomic applications in drug discovery and target deconvolution: identification of the pleiotropic effects of statins. Drug Discov Today 2017;22:848–869.